NewCom utilizes advanced GIS technology to support your project. Where possible, local cadastral data is integrated. Our advanced GIS Fiber to the Home ( FTH ) software platforms include Telcordia’s Network Engineer. With backgrounds in operations and compliance, NewCom follows all federal, state and local guidelines and laws. And our experience extends to compliance with RUS, ARRA BIP and BTOP, FCC Rural Health Care Programs rules and technical regulations. Serving the telecommunications industry for 15 years, combined with its close strategic alliances with industry specialists, NewCom offers you a full complement of focused resources to support your FTTP project. NewCom has a history of work on very large-scale projects, and has built up a national network of resources in all engineering areas from which it can call upon. In addition, as an ESRI Business and Development Partner, NewCom can provide a seamless integration of the FTTP network into any stakeholder’s GIS system. Our internal production team uses the most advanced technology solutions, consisting of AutoCAD, Micro Station, Telecordia, and ESRI platforms. Furthermore, depending on the level of data collection, our field crews could be equipped NewCom’s Voyager, a mobile GIS inspection/data collection technology. NewCom’s team has designed and built plant from rugged rural terrain to teaming cities through all seasons and has integrated planning and implementation procedures exclusively designed to meet specifications and deadlines for telecommunications providers. In addition, NewCom developed and implemented specialized GIS software applications to help its telecom clients manage geographically dispersed assets—clients such as AT&T, McLeod, Mediacom, and Verizon. NewCom can provide consultation in all areas of facility planning — subscriber line telephone systems, feeder allocation, and distribution analysis. Whether your engineering needs are in new plant or plant extensions or upgrade of existing networks, NewCom has diverse experience in fiber, coax, and copper network facility. 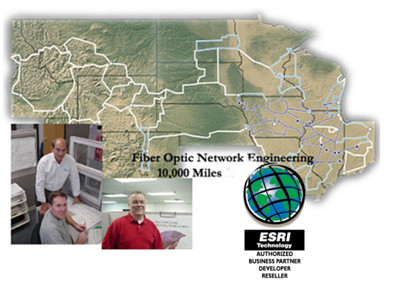 Development of long-range OSP plans, including dispersion of fiber pairs and technologies along the route. DSL deployment within the exchange including a review of the entire set of records to determine the ability to change architecture to meet DSL requirements. Feeder solutions to new developments. Fiber optic network planning is performed to maximize the value of your capital; such as pushing fiber solutions further out in order to provide broadband high-speed data to customers. NewCom can audit and document your existing standards of practice and procedure for construction, field engineering, and design and drafting; and, if requested, NewCom will suggest improvements. Throughout the country, NewCom has performed route engineering for long haul and city fiber optic, requiring contact with a variety of local and state governments. We would like to put those contacts to work for you in right-of- way acquisition, easement title search and acquisition, survey coordination, exhibit preparation and easement recording. Not only do we have processes in place that streamline our field collection activity, we make every effort to protect you from unanticipated problems in construction, maintenance, and operation. Along with fully permitted construction detail prints, NewCom can also make application for construction permits as part of the design process. A customized Material Requirement Sheet is prepared at the completion of the design phase. Meeting your specific requests, the Material Requirement Sheet often includes differentiation of new cabling requirements versus reuse of existing and a comprehensive list of hardware for the network elements, including the support structure. Field notes are scanned and archived as image files and provided as a final project deliverable reducing your need to store paper files. As a common practice, any deficiencies in the plant standard can be identified during field data collection: Such as proper resistance design parameters from end to end, including documentation. NewCom will act on your behalf in property acquisition and rights of way negotiations. We also make sure that local and state governmental jurisdiction requirements for aerial and underground communication facilities are met; including, if required, accordance with the National Electric Safety Code and National Electric Code. Route engineering includes make-ready recommendations and can include pole attachment applications. For underground facility, NewCom can prepare conduit design, conduit detailing, manhole detailing, prepare all forms and documentation for approval of conduit construction and/or installation, and verify as-built. Many of these collaborative exchanges have produced bottom-line benefits for the System. For instance, some operators have profited from NewCom’s enhancements such as a 911 compliant format for easy interface with LECs (reducing future compliance expense) and imbedding data to support facilities management audits such as hardware pole attachments and duct availability (for expense control and identifying potential revenue streams). NewCom specializes in AutoCAD—always the latest version. And AutoCAD’s powerful programming language flexes to fit many other platforms. CAD also provides a basis for integrating diverse data into an enterprise-wide information system. Network information can be created from a variety of CAD and Geographical Information Systems (GIS) platforms that will integrate with your current information storage system (from file cabinets to legacy computer systems). NewCom CAD services include detailed site drawings, permit detail drawings, and presentation quality overview maps. The benefits of CAD over conventional paper-based drawings, in general, are easy retrieval, easy modification, and the drawings can be printed in paper form to support maintenance activities. In addition, you may opt to archive the plant as-built information in CAD. In this form, the elements that are required for design and construction can be viewed seamlessly as a background to the network drawing files. Creating databases that document facility audit results: For example, pole attachment inventory for pole attachment agreements between you and other utilities. Although drafted in CAD, the data can be stripped off and placed in database form for your analysis; and the data may also be associated with digital imagery of pertinent facilities. If you document your system in a CAD environment or make the decision to move to the digital format, NewCom can often provide solutions to enhance the CAD data with our GIS processing capabilities. These processes can extract critical elements from state and local government Geographic Information Systems when available. This data integration typically reduces costs to the Operator, improves the quality of the data, and builds a basis for common interchange between the operator, other regional utilities, and local and state governments. During the course of any project, we continuously review our processes to speed up and simplify production of deliverables. These improvements are sometimes global but usually unique to each project; however, any custom software tools that function exclusively with projects developed by NewCom are yours to keep.